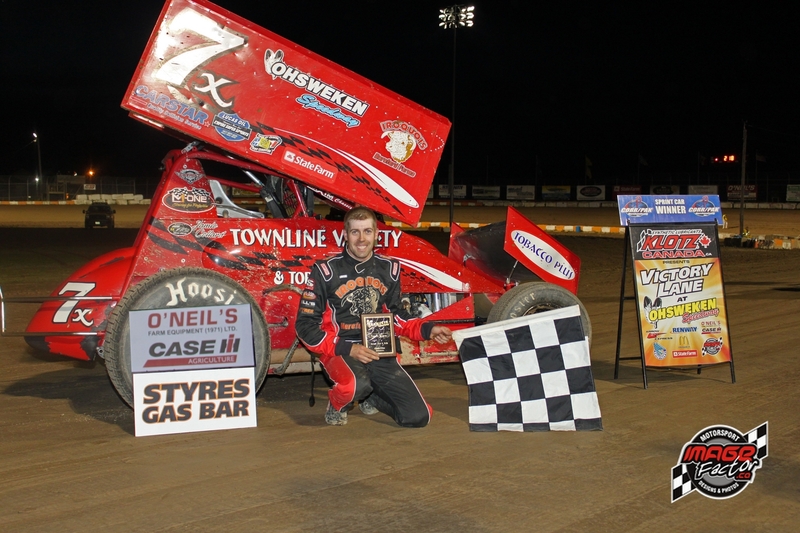 by Tommy Goudge (July 5, 2013) – 100 drivers signed in to race on a fast-paced O’Neil’s Farm Equipment and Styres Gas Bar night at Ohsweken Speedway on Friday night, which ended at 10:15pm. The weather forecast didn’t keep the races from running, Jamie Collard, Wyatt Van Wart, Davey Boughton, and Jesse McDonald from visiting Klotz Canada Synthetic Lubricants Victory Lane, or Mini Stock racer Chad Smelser and Cynthia Manseau from getting married on the track at intermission. Shane Ross and Jim Huppunen drew front row starting spots for the Sprint Car feature, and Ross took the early lead. Keith Dempster looked to be a contender for the feature win, but lost his right rear tire on lap 9. Dempster was able to restart after attention from his crew, and came back to finish 9th. Lap 9 also saw trouble for Chris Steele and Tom Huppunen, as Steele got sideways exiting turn 4, and Huppunen spun to avoid and tipped over. Steele restarted, but Huppunen could not. Jamie Collard moved up steadily from his 6th starting spot, and got by Jim Huppunen for the 2nd spot on lap 11, while Ross continued to lead. Collard used the high side to chase down Ross, and made the winning move in traffic with less than 2 laps remaining. Collard claimed his 4th career Ohsweken win, followed by Ross, Jim Huppunen, row 7 starter Todd Hoddick, and Glenn Styres. Heat races for the 19 car field were claimed by Keith Dempster, Derek Jonathan, and Glenn Styres. 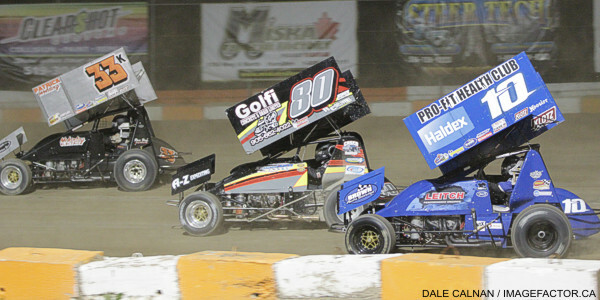 Steve Hess and Kacey Huffman were the front row starters for the Thunder Stock feature, and Hess took the early lead before some championship contenders began to move through the field. Defending champion Mike Thorne started 8th, but he was the leader by lap 3. Wyatt Van Wart followed Thorne through the field, and led laps 5 through 7 before Thorne took over again to lead 5 more laps. Van Wart led the remaining 8 laps of the 20 lap feature, but most only by a few feet, as Thorne was joined by Lee Winger and Chris Dickie in a 4-way fight for the win. The win was up for grabs, as the leaders were 4 wide in turn 4 on the last lap, but Van Wart held on to take the win, just 0.074 seconds ahead of Thorne. Winger took third, followed by Dickie, and Karl Sault. Heat races for the 38 car field were claimed by Steve Hess, Mike Thorne, Lee Winger, and Brad Herron, while Jake Brown won the B-Main. Leading the race was bad luck early in the Mini Stock feature, which saw Mike Taylor and Kathi Dickie start on the front row. Dickie’s race ended with broken rear suspension parts, while John Cote lost a wheel after making his way to the front from row 7. Championship contenders Davey Boughton, Alex Schuts, and Jason Lungaro eventually got to the front from their handicapped starting positions deep in the field, and Boughton prevailed for his 4th win in 6 tries. Schuts settled for the runner-up spot, followed by Lungaro, B-Main winner Chase Hess, and Steve Miller. Heat races for the 29 car field were claimed by Kathi Dickie, Dave Goodacre, and John Cote, while Chase Hess won the B-Main. Dakota Potts and Clinton Nicholls made up the front row for the Bomber feature, but Jesse McDonald quickly made his way through the field from row 4, and went on to take his second feature win of the season. Max Chechalk, Dusty DeBoer, Wayde Thorne, and Tim DeBoer made up the rest of the top 5. Heat races for the 14 car field were claimed by Valen Longboat and Brady Longboat. Best Western Cairn Croft Hotel and Kool Kidz Ice & Water present Canadian Diabetes Foundation Night at Ohsweken next Friday, July 12, featuring the Empire Super Sprints versus the Corr/Pak Merchandising Sprint Cars, Affordable Towing & Recovery Thunder Stocks, HRW Automotive Mini Stocks, and Gale’s Auto Aftermarket Bombers, plus Vintage Cars. 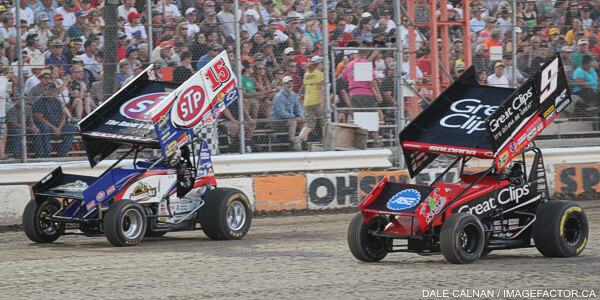 Spectator gates open at 6:00pm, with racing starting at 7:30pm! 1. 5 Keith Dempster (Alton), 2. 80 Chris Steele (Fenwick), 3. 3r Shane Ross (Thedford), 4. 71 Travis Cunningham (Grimsby), 5. 49 Todd Hoddick (Cheektowaga, NY), 6. 90 James Evans (Beamsville), 7. 10j Jeremy Hughes (Burlington). Time – 1:50.194. 1. 81 Derek Jonathan (Lewiston, NY), 2. 14h Jim Huppunen (Fenwick), 3. 7x Jamie Collard (Burford), 4. 30g Steve Goldner (Aylmer), 5. 31 John Burbridge, Jr. (St. Williams) DNF, 6. 10 Mitch Brown (Brantford) DNF. Time – 1:51.402. 1. 0 Glenn Styres (Ohsweken), 2. 52 Jesse Costa (St. Thomas), 3. 5c Conor Mahoney (Waterdown), 4. 27h Tom Huppunen (Fenwick), 5. 9nz Havard Daniels (Coatesville, NZ), 6. 11 Jamie Turner (Caistor Centre). Time – 1:48.967. 1. 777x Steve Hess (Ohsweken), 2. 13 Kacey Huffman (Hamilton), 3. 68 Aaron Turkey (Ohsweken), 4. 5h Devin Habiuk (Port Robinson), 5. 23 Trevor DeBoer (Caledonia), 6. 00 Robbie General (Ohsweken), 7. 4 Dale Gyokery (Jarvis), 8. 911 Nick Liverance (Brantford), 9. 93 Melissa Miller (Ohsweken) DNF. Time – 2:42.719. 1. 55 Mike Thorne (Caledonia), 2. 73 Mike Miller (Cayuga), 3. 38 Terry Martin (Ohsweken), 4. 11r Bryce Richardson (Port Colborne), 5. 04 Wyatt Van Wart (Cambridge), 6. 57 Murray Nicholls (Hamilton), 7. 10 Jake Brown (Brantford), 8. 77 Brett Rodwell (Caledonia) DNF, 9. 44 Kevin Dawson (Caledonia) DNF. Time – 2:39.977. 1. 2 Lee Winger (Caledonia), 2. 1 Chris Dickie (Brantford), 3. 9 Dave Silverthorn, Jr. (London), 4. 84rk Ryan Beagle (Vittoria), 5. 81 Karl Sault (Dundas), 6. 85b Ryan Dinning (Caledonia), 7. 17 Rob Disher (Grimsby), 8. 33 Jack Myers (Wainfleet), 9. 3b Blaine Barrow (Welland), 10. 48 Mike Graham (Caledonia) DNF. Time – 2:37.813. 1. 12 Brad Herron (Brantford), 2. 28 Jim Lampman (Caistor Centre), 3. 91 Ryan Turner (Caistor Centre), 4. 00x Derek Miller (Ohsweken), 5. 19 Cory Turner (Caistor Centre), 6. 05 Pete Reid (Niagara Falls), 7. 31 Dave Bailey (Hagersville), 8. 85h Curt Styres (Ohsweken), 9. 119 Shaun Quinn (Caledonia). Time – 2:38.177. 1. 10 Jake Brown, 2. 33 Jack Myers, 3. 05 Pete Reid, 4. 31 Dave Bailey, 5. 44 Kevin Dawson, 6. 85h Curt Styres, 7. 48 Mike Graham, 8. 00 Robbie General, 9. 4 Dale Gyokery, 10. 93 Melissa Miller, 11. 911 Nick Liverance, 12. 85b Ryan Dinning DNF, 13. 3b Blaine Barrow DNF, 14. 119 Shaun Quinn DNF, 15. 17 Rob Disher DNF, 16. 23jr Dave Bitner, Jr. DNF, 17. 57 Murray Nicholls DNF, DNS. 77 Brett Rodwell. No Time. 1. 1 Kathi Dickie (Brantford), 2. 96t Mike Taylor, 3. 66r Cole Rodwell (Caledonia), 4. 21 Jonathan Ayrton (Hamilton), 5. 16 Jeremy May (Hamilton), 6. 29 Lucas Lubin (Hamilton), 7. 84 Jade Pelletier, 8. 11 Mike Giberson (Caledonia), 9. 69 Rob Twitchett (Dundas), 10. 76 Jamie Goudge (London). 1. 05 Dave Goodacre (Brantford), 2. 79 Steve Miller (Paris), 3. 66 Jon Janssens (Woodstock), 4. 64 Doug Erskine (Hamilton), 5. 69e Dan Erskine (Caistor Centre), 6. 10 Laura Hughes (Puslinch), 7. 7x Chase Hess (Ohsweken), 8. 53 Herbie, 9. 90 Chad Smelser (Dunnville), 10. 22 Brittani Myers (Hamilton) DNF. 1. 38 John Cote (Hamilton), 2. 7 Jason Lungaro (Hamilton), 3. 265 Mike Evers (Caledonia), 4. 81 Alex Schuts (Oakland), 5. 99 Robin Elliott (Woodstock), 6. 8 Barry Westman, 7. 5 Rick Robinson (Brantford), 8. 12 Chantelle Hyatt (Millgrove), 9. 18x Davey Boughton (Carlisle) DNF. 1. 7x Chase Hess, 2. 18x Davey Boughton, 3. 53 Herbie, 4. 69 Rob Twitchett, 5. 90 Chad Smelser, 6. 76 Jamie Goudge, 7. 5 Rick Robinson, 8. 84 Jade Pelletier, 9. 11 Mike Giberson, 10. 12 Chantelle Hyatt, DNS. 22 Brittani Myers. 1. 7L Valen Longboat (Ohsweken), 2. 43c Clinton Nicholls (Hamilton), 3. 21 Mark Bazuin (Caledonia), 4. 6 Wayde Thorne (Waterford), 5. 03d Dakota Potts (Waterford), 6. 36 Skip Brandow (Orwell) DNF, 7. 32 Gillian Hils (Dundas). 1. 66 Brady Longboat (Ohsweken), 2. 88 Jesse McDonald (Caledonia), 3. 97 Max Chechalk (Hamilton), 4. 9 Tim DeBoer (Caledonia), 5. 23 Dusty DeBoer (Hagersville), 6. 6h Lee Hils (Dundas), 7. 42 Joe DeBoer (Hagersville). ADULTS $15, SENIORS AND STUDENTS $12, KIDS 12 AND UNDER FREE!